Assessing how global climate change might affect soil carbon levels is not a simple matter, in part because accurately measuring current soil carbon sequestration levels—the amount of carbon that is retained in the soil—has its challenges. Developing processes for accurately measuring soil carbon sequestration is a concern for producers, who want to be able to fine-tune agronomic practices and use them in a suite of approaches for mitigating carbon emissions that contribute to global climate change. One tool for increasing soil carbon sequestration is to reduce fallow periods. Another tool is to use conservation tillage, which also recycles plant nutrients, moderates soil temperature, conserves soil water, controls soil erosion, and provides food and habitat for soil fauna. Gollany wrestled with soil carbon measurement protocols when ARS agronomist Frank Young sent data to her from three Pacific Northwest production systems and enlisted her expertise to project how climate change would affect carbon sequestration levels in each practice. The data included carbon levels measured in soils from three crop-rotation systems: winter wheat/reduced-tillage fallow, no-till spring wheat/spring barley, and no-till spring barley/spring wheat. Gollany works at the ARS Columbia Plateau Conservation Research Center in Pendleton, Oregon, while Young works at the ARS Land Management and Water Conservation Research Unit in Pullman, Washington. Sequestering and keeping carbon in these dryland soils is particularly difficult because the weather restricts plant growth. As a result, there’s a limited supply of postharvest crop residue available to break down and replenish soil carbon levels—and a limited supply of moisture, which means decomposition is a slow process. 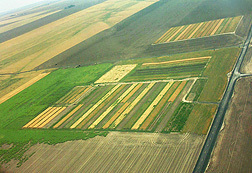 Gollany used the computer program CQESTR to generate six 15-year cropping scenarios. CQESTR was developed to calculate how a range of agronomic and weather-related variables could affect crop residue decomposition and soil carbon sequestration levels. The projections showed a wider range of sequestration levels than expected, depending on the timing of crop residue inputs. To Gollany, these results indicated that the original total soil carbon data varied because it contained accrued—that is, accumulated—plant carbon and not sequestered carbon. 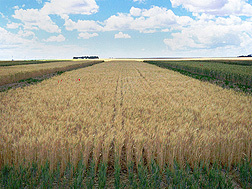 Winter wheat plots before harvest at Ralston, Washington. Several methods are commonly used to determine whether carbon is bonded to soil mineral particles. This bonded fraction is considered sequestered and part of the stable soil carbon pool that can remain relatively unchanged for decades, or even centuries. One method is called “light-fraction extraction,” and it measures a transitory carbon pool that is somewhere between fresh plant residue and stable soil organic matter. “Light-fraction carbon is found in plant matter that hasn’t decomposed yet, so even though it has accrued on the soil, it isn’t sequestered,” says Gollany. But this transitory carbon is still part of the total soil carbon pool and can improve soil properties for a short period of time, such as a single growing season. Accrued carbon can readily be lost from the soil because it is not bound to or associated with soil particles. It does not provide the long-term improvements to soil chemical and physical properties that sequestered carbon provides. And inadvertently adding accrued carbon to measurements of sequestered carbon results in overestimates of how agronomic practices affect sequestration levels. Gollany and Washington State University soil microbiologist Ann-Marie Fortuna decided to reevaluate the field samples by looking for the light-fraction carbon. Using this method, the scientists determined that carbon levels in the samples included the carbon from fine crop residue materials that passed through the sieves during sample processing—carbon that had accrued in the soil but was not yet sequestered via decomposition. The light-fraction carbon (as a percentage of total carbon) was higher when measured in the spring than in the fall. This, in turn, skewed attempts to use carbon data from the samples to model soil carbon sequestration levels. When Gollany adjusted the measured carbon values for these discrepancies, the CQESTR results indicated that as precipitation patterns change, existing winter wheat/fallow systems using current winter wheat varieties might not be feasible for future production in the Pacific Northwest. Even though more precipitation might fall in some regions, the projected changes would not be sufficient to support significantly greater amounts of wheat straw that could add carbon to the soil. The additional soil water and warmer soil temperature might also reduce carbon sequestration rates by increasing residue decomposition, which in turn would accelerate the release of carbon from the residue in the form of carbon dioxide. 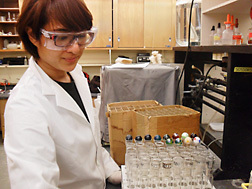 Gollany published her findings in 2013 in the Soil Science Society of America Journal and says this is the first time light-fraction carbon data has been used to generate CQESTR estimates of soil carbon sequestration. “There are several key takeaways from this study,” Gollany says. “When and how we take soil samples is very important for future climate change studies, to make sure we don’t overstate how much carbon we can sequester. We also need to continue to look to no-till production to manage the effects of climate change, and we need to calculate ways we will be able to take advantage of changes in precipitation.”—By Ann Perry, Agricultural Research Service Information Staff. Hero Gollany is in the USDA-ARS Soil Conservation Research Unit, Columbia Plateau Conservation Research Center, P.O. Box 370, Pendleton, OR 97801; (541) 278-4410. "Details Matter in Modeling Carbon Sequestration and Cropping Systems" was published in the July 2014 issue of Agricultural Research magazine.